the Protec Pool Party at Vans in May 2010. And sometimes banks and ditches. And we were all teenagers and we all wanted to rule the world. Later on, even the pros were all in their early 20’s. Actually, the average career of a pro skater used to start in the late teens or early 20s and was usually over by the time the pro hit 25. But today, many of the top pros are in their early-to-mid 30s. 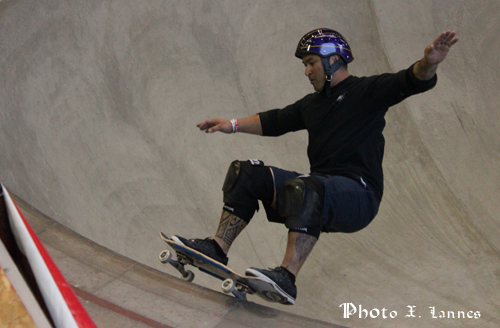 Some legends never gave up though, they stay healthy just because they keep-on rolling and still skate, well over 45. Some of them are born-again skaters, some other never quit, really. Skateboarding is a state of mind, not a sport. It’s well known, you don’t stop skateboarding because you grow old, but you definitively grow old because you stop skateboarding! Here is the portrait of 5 vert riders, all of them well over their mid 40's: Lonny Hiramoto, Jeff Grosso, Christian Hosoi, Lance Mountain, Steve Caballero. Those guys were already skateboarding when the Ranch, the Runway, Pipeline, Marina Del Rey, Oasis, Big O, Mt Baldy were the golden place to be and they are still ripping and shredding the copings of the Southern California pools with style, every day that God made, progressing, inventing or perfecting tricks, winning contests, appearing in ads, filming videos and inspiring skaters of every age. Lonnie Hiramoto at Vans, July 2010. I have at least 3 main reasons to include Lonny Hiramoto to that list. The first reason is that we competed together at the Runway in Carson in 1978. He finished first, I arrived last… Don’t laugh; please I had already enough jokes in the 70’s from my French “buddies”… On top of that, Lonnie (with Bobby Valdez) was on the cover on the skateboarding book I wrote in 1979 (don’t look for it, it’s written in French and it’s long oversold…). 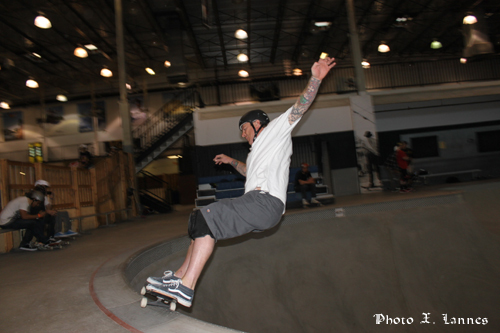 The third reason is that now, at 45, Lonnie is still charging hard and can be found almost every day tearing up the coping of the Combi Pool at Van’s. But before the Combi, Lonnie used to skate the 17' bowl at the Runway in Carson, where I first met himLonnie Hiramoto actually started riding in 1976 at the age of 11. Not only he was the local "Wild Child" at the Runway, but he also spent a lot of time at Skateboard World (Torrance) and Skatopia (Anaheim – where he still lives). Lonny Hiramoto at Vans. Photo MRZ. Lonnie quickly formed a bond with another rising star: Howard Hood. He then was regularly seen in the backyard pools of Palos Verdes with Dan Harkin. In addition, he frequently sessioned hard with Shogo Kubo, Steve Olson, Salba, Ty Page and Mike Weed. All were early influences and helped rocket his approach and style. By the age of 13, just two years into his career, Lonnie was already touring the world as a Pro and had a Pro Signature model deck with Kanoa Surf. Kanoa Surf's owner, Tuzo Jerger, often referred to his young prodigy as "The Little Emperor" because Lonnie always felt "entitled" to WAY too much Swag! Lonnie is currently riding for Madrid, Indy, Khiro, Hosoi, Transitions Skate Shop and Flyaway helmets. He still competes a few times a year (he was a competitor at the last Protec Pool Party) and will be releasing a new pro model soon. Like other pool riders over 45, Lonnie has that special style that makes people think skateboarding in deep pools is actually easier than walking on thin ice. 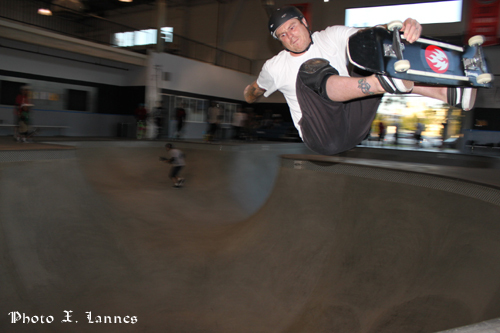 Jeff Grosso in the square pool at Vans. June 2010. 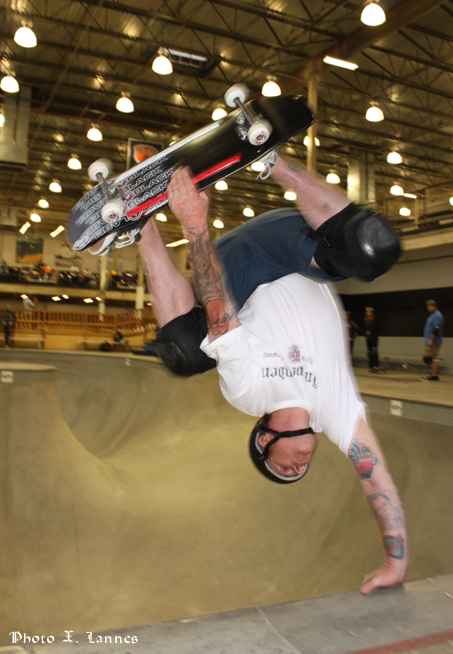 It took me 2 decades to meet Jeff Grosso, but the wait was worth it. Last winter, I regularly skated with him at Vans when he was training almost every day for the Protec Pool Party. Was he really training? I sometimes wonder if he was not just enjoying himself, as for him skateboarding seems like a second nature while others still eat greasy food and watch football games on the TV and get fat over the years. Although he is a real gentleman; letting you take turns in the Combi while watching; skating with Jeff is astonishingly impressive and quite an experience. He skates with an unreserved concentration, he would not even notice if a fly landed on his nose and his positive and relaxed attitude let people think he has Zen genes in his DNA, which he certainly has. His moves and tricks are fanatically powerful, stylish and insanely precise showing more than 2 decades of experience. Above all he is the master of the “never-give-up” attitude. I saw him hundreds of time methodically jumping at full speed from the shoulder of the square pool, landing in the coping of the round pool like a freight train and sliding 10, 20, 25 blocks until almost complete stop, suspended into thin air above the void and jumping again into the round pool with a flagrant whoosh of air. Even a 10 block slide looks sick to me, so when he reached the two third of the pool (28 blocks slide) at the Blocks For Bucks contest of the Protec Pool Party and every one went utterly wild. Jeff won $2000 for this slide which was worth every penny and I proudly though “atta boy”!. That 28 block slide is not only a milestone for Jeff, but for the Protec Pool Party too. Jeff Grosso has had ups and downs in his life and skate career but as his friends will tell you, when he steps on a skateboard he gives 110 percent. The people that have been fortunate enough to witness Jeff's skating, fom the Variflex era with Allen Losi, Eddie Elguera, Eric Grisham, the Hersh Brothers, Lance Mountain, John Lucero, to Santa Cruz, then Powell, Schmitt Stix, and finally Black Label all say the same thing. From Lopes' ramp, Mile-high, Whittier, Del Mar, Kennedy Warehouse, Pala, Vans, all those people that met him are saying that the one characteristic about Grosso’s riding is how such a big powerful guy can put such finesse to a trick. Grosso has tattoos all over his body, one of them, supposedly Charles Bukowski: “ Bukowski died and I went on a drinking binge and woke up with this Wink Martindale tattoo. It's supposed to be Bukowski, but it looks more like Larry King. Most of my tattoos are friends. I have my friends' board graphics. Jeff Grosso: Imagine a freight train doing an aerial… That’s just the big picture. Black Label skateboards founder and lifelong friend John Lucero is quick to point out Grosso's appeal to skaters of all ages. "He has a youthful perspective on things and anybody from the crustiest old vert guy to the young guy on the street can identify with Jeff because of his never-give-up attitude. He still skates super big and super powerful." In the 80’s Christian Hosoi had everything: fame, fortune, parties, friends, girls, skate, a quasi rock star lifestyle and drugs a go-go. My brother, who used to skate with Christian in the mid 80’s, still tells me weird stories of the time when they were all living at Venice, like when they were assaulted by a bump who finally just wanted to steal their fresh hamburgers on the doorway out from the local McDonald’s. At that time, there was no skatepark at Venice and the one at Marina Del Rey (the one where Christian’s father was the manager…) had just been destroyed… There are also untold stories of Venice that will never surface… God only knows… Christian’s is my brother’s buddy and his hero too. How can’t that be? In the 80’s, no skater had more fame than Christian Hosoi. But his rock star lifestyle hit rock bottom in the '90s and he wound up in prison on drug-related charges. He was released in 2004 and began skating with a new purpose, faith and the same sparkle that brought him fame in the first place. 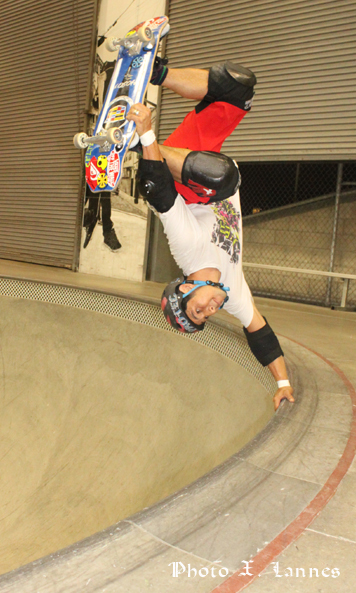 Hosoi was the subject of the 2006 documentary film “Rising Son - The Legend of Skateboarder Christian Hosoi” that detailed his initial success, drug addiction, and conversion to Christianity. Christian joined forces with Jay Haizlip, Brian Sumner, and others to create The Uprising, a skate based ministry. In 2008 The Uprising was documented by Steelroots, a Christian Youth Television Network, and made into a reality television show. The first season comprised eight episodes following the ministry around California and England. Season 2, began airing in fall 2009. "[He] skates like Muhammad Ali boxed," says Girl and Vans pro Alex Olson. "It was never jerky. It was all one motion. There are few people who can dress insane and get away with it in the public eye. Those people are natural talents. Christian was and still is one of those people." Christian is so different from the others that, every time I see Christian walking around the pool, I wonder if he doesn’t have some royal blood in his veins. For the past several years, Christian has regained his lost fame: he participated in several contests, including the Venice opening contest, the Tim Brauch Memorial Contest, the Protec Pool Party, the Coastal Carnage and other contests throughout Southern California … He finished 1st twice: at the X Games 15 Skateboard Park Legends in 2009 and the X Games 16 Skateboard Park Legends in 2010. You can see him skating a lot at Vans and Venice skate parks. Christian Hosoi at Vans June 2010. Now you see it, now you don't. Can you spot the 7 differences? 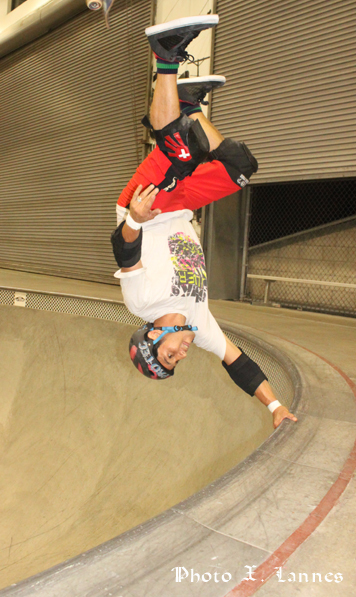 Hosoi is so good at what he's doing that he can even do a handplant without holding his board. That's sick, isnt'it? Lance Mountain was one of the more popular skateboarders throughout much of the 1980s, and one of the five most legendary members of the Bones Brigade. Lance Mountain was a top competitor during street skating's first phase, but he quickly specialized at riding vert, where he regularly placed in the top five. First sponsored by Variflex in 1981 before joining Powell Peralta a year later, where he formed a strong friendship with Stacy Peralta, the team leader and director of the Bones Brigade video series. 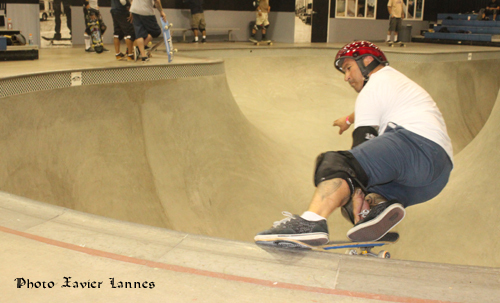 Lance Mountain at Vans, May 2010. Mountain gained further eminence when he won the Upland Turkey Shoot at Upland Skatepark in 1983, against tough competition from fellow team riders Steve Caballero, Mike McGill and Tony Hawk. This was followed by Mountain acting as the backdrop of skateboarding's first, full length company video, The Bones Brigade Video Show, from 1984. In it, Mountain serves as the segue for all the vert and freestyle parts as he skateboards around Los Angeles, showcasing street skating in its infancy as a legitimate discipline. In the early 90's, the skateboard industry went through a major shift as street skating overtook vertical skateboarding as the dominant discipline, and the popularity of the Bones Brigade faltered as the next wave of skaters made a name for themselves. He left Powell Peralta and started his own skateboard company, "The Firm" in 1991 with notable skateboarders including Bob Burnquist, Ray Barbee, and Rodrigo Teixeira. On March 13, 2006, Lance Mountain announced the end of The Firm. He is now riding for Flip Skateboards, in addition to Independent Trucks, and Stüssy clothing. On May 7, 2007, Nike SB announced the addition of Mountain to their team. Mountain is often cited as one of the inventors of the fingerboards, back in the late 70's, fashioning out of cardboard, pencil erasers, and a disassembled Hot Wheels toy. Of all the people in this gallery, Lance Mountain is the only one to put out a full, brand-new video part in the past year. At 46, Mountain put his body to the test and rolled away with cinematic gold in Flip Skateboards' "Extremely Sorry." Flip teammate and legend in his own right Geoff Rowley articulates why Mountain still connects. "Out of all the legendary skaters out there, none have ripped as hard nor as long as Lance. With such a love for skateboarding, its past, present and future, Lance has spread the love and power of skating to so many kids and to quite a lot of fully grown men!" it's amazingly smooth fast and effortless!" Original Bones Brigade rider Steve Caballero's career spans over three decades, and his name adorns one of the most popular skate shoes of all time: the Vans Half Cab. Caballero started skating in 1976 at the age of 12. He was sponsored as an amateur by Powell Peralta in 1978 at the age of 15. He turned pro in 1980 at the Oasis Skatepark, Southern California during the Gold Cup series. As a member of the Bones Brigade, he has appeared in many of their videos, including “The Search For Animal Chin”. His current sponsors include Powell Peralta Skateboards, Bones Bearings, Independent Truck Company, Autobahn Wheels, Vans Skate Shoes, Skull Candy headphones, Ohana Boardshop and Protec Helmets. His past sponsors included Tracker Trucks, Standard Trucks and Bones Wheels. 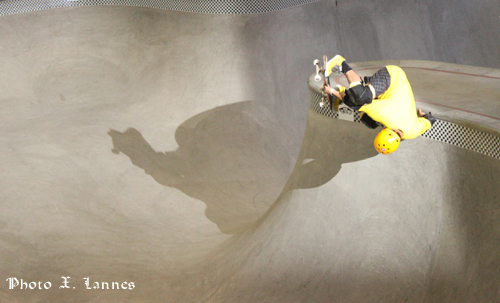 Cab invented the Caballerial, around 1980, in the 10 ft. keyhole pool at Winchester Skatepark in Campbell, California. He also invented the frontside rock n' roll slide (now more commonly referred to as a frontside board slide). Cab has been a member of several punk bands including The Faction, Odd Man Out, Shovelhead, and Soda, and released a compilation CD of the various bands he has appeared in titled Bandology through Sessions Records. He also paints, collects toys, rides motocross, and is a hot rod enthusiast. He was brought up as a Catholic, studied Zen/Taoism for 6 years, and in 2005 returned to a non-denominational Christian church. He continues to skate and inspire the others. 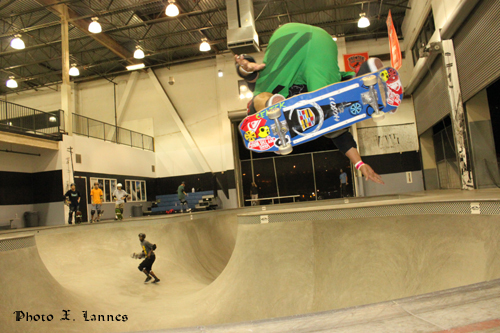 He regularly skates at Lake Cunningham and participate at several contests every year, including the Protec Pool Party. Longtime Powell teammate and new pro Jordan Hoffart is grateful for his influence. "Aside from being a legendary skater, Stevie has been a huge influence in my personal life off the board. He's one of the most logical, kind-spirited people I've ever known. Time and again, his conversations leave me inspired." I invented this trick in 1980 after seeing and learning Eddie Elguera's frontside rock and roll! I first tried and learned them in the little egg shaped pool at Winchester skate park and then I took it to the big keyhole pool soon after. I feel so blessed to be able to still rock them 30 years later.